Last summer I shared about the brilliant interior design work my friend Paige (of Tess & Ted) did on our home and I'm thrilled that she is going to do a recurring series on home decor and design for Boston Mamas. She is so clever! 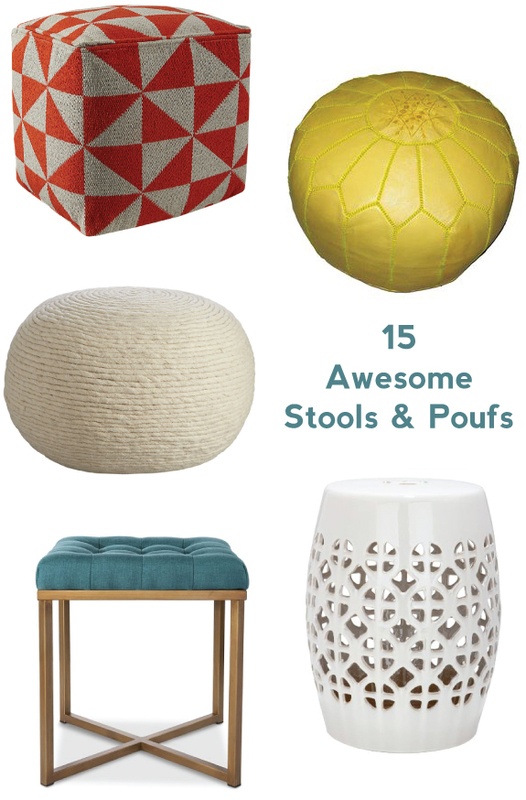 Paige believes that everyone deserves a cozy, pretty nest and for the first post in the series -- Make Your Home Awesome -- she shares recommendations for impacting, affordable stools and poufs. Nearly every time I design a room for a client, a stool or pouf makes its way into the final floor plan. These great multitaskers are one part extra seating, one part side table, one part foot rest, and all parts useful. If you need a quick room refresh, a hit of color, or a functional piece to fill an empty space, one of these 15 options should do the trick. 1. Add a touch of mid-century modernism to any room with the addition of this classic butterfly stool from France & Sons ($109). 3. Need some pattern in your life? Add a powerful, classic graphic with this cubic pouf from CB2 ($129). 4-5. Looking to add a contemporary and playful style to your home? Take a look at the ErgoErgo stool ($100) and Riki stool ($45), both from the MOMA Store. Take note, the Riki is made of cardboard (! ), but holds over 1,000 lbs. If that’s not excellent design, I don’t know what is. 6. If you need a some extra seating that doubles as storage, try the Bubble Stool from the Container Store ($39.99). Perfect for a playroom! 7-8. Natural and neutral is a winning combination for both this rush grass storage ottoman from Wayfair ($69) and this wool wrap pouf from CB2 ($129). 9. Feeling bold? Add texture to a nursery or family room with this furry white pouf from Amazon ($41). 10-11. Classic and chic, X-stools have been the darlings of the design world for a while now. The Brendan x-base stool from Cost Plus World Market ($64.99) and green floral stool Target ($29.98) both illustrate how upholstery alone can completely change the look of this simple and elegant form. 12. While this is a slight departure from the traditional definition of a pouf, I couldn’t help but include this awesome gold beanbag from Urban Outfitters ($129). I might just have to get this for my office. 13. I’m loving this DIY modern take on a Colonial milking stool ($5 for materials!). 14. Add a global feel in sunny yellow with this leather Moroccan ottoman from Overstock ($135). 15. Looking for a piece that can work both inside and outside? Consider this ceramic garden stool from Domino ($138).